Posted in Advice from Lama Zopa Rinpoche, Lama Zopa Rinpoche News, Lama Zopa Rinpoche News and Advice. Lama Zopa Rinpoche at Kurukulla Center, Medford, Massachusetts, US, August 2018. Photo by Ven. Lobsang Sherab. 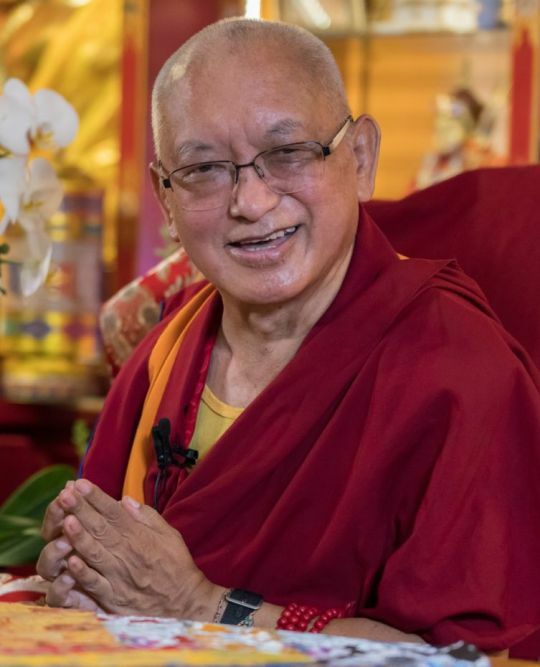 Lama Zopa Rinpoche offered thanks to all the FPMT centers, projects, services, and students who did practices requested by Rinpoche to benefit Tibet and for the success of fulfilling all of His Holiness the Dalai Lama’s wishes. I felt that we need to help, as we are His Holiness’ disciples. Of course, “guru”—that means all our happiness, past, present, and future up to enlightenment, came from the guru: His Holiness the Dalai Lama. Every single pleasure, happiness, came from His Holiness. His Holiness has guided us from beginningless rebirths, now, and in the future. Can you imagine the kindness of the guru? The kindness of the guru is like the limitless sky. I want to say a billion, zillion, numberless thanks, really from my heart, to everybody who did the prayers to help His Holiness, to help Tibet to receive soon freedom. So thank you very, very much. Thank you so much. This is the most extensive way to collect merit and the most powerful purification—fulfilling the guru’s wishes. You collect all those merits in one second. The guru’s path, if you fulfill all those, one-thousand-eon merits you collect in one second. When you fulfill the guru’s wishes and advice, this is also what happens. It gets purified in one second. The heavy negative karma collected from past lives and now gets purified in one second. Oh, it is so powerful, this happens. I think that’s all. Thank you very much. Rinpoche made the request in June 2018 that 50,000 recitations of the Mantra Promised by the Arya Mother Liberator Herself and 500 Four Mandala Offering to Tara pujas be done by July 12. FPMT centers, projects, services, and students completed 340,941 mantra recitations and 7,298 Four Mandala Offering to Tara pujas! Rinpoche recorded the video message of thanks on August 20, 2018, in Boston, Massachusetts, US. More information, photos, teaching schedule, and updates about FPMT spiritual director Lama Zopa Rinpoche can be found on Rinpoche’s webpage on FPMT.org. If you’d like to receive news of Lama Zopa Rinpoche and FPMT via email, sign up to FPMT News.